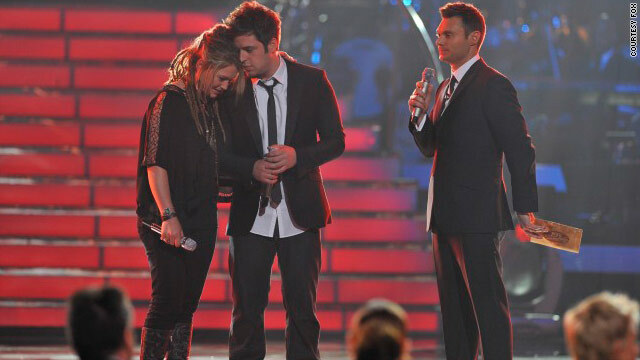 Crystal Bowersox and Lee DeWyze lean on each other just before Ryan Seacrest reveals DeWyze as the new "American Idol." Larry King talks to "American Idol" winner Lee DeWyze and runner-up Crystal Bowersox. Watch "Larry King Live" at 9 ET Friday night on CNN. (CNN) -- The 2010 "American Idol" finale can be summed up in three words that could also be attributed to the entire season: dull, pitchy and off. From the show's opening, with a mediocre performance by aged rocker Alice Cooper to a lineup of seemingly random artists, many of whom didn't at all fit the perceived youthful "Idol" demographic (Michael McDonald? The Bee Gees? Chicago?!? ), to the rambling return of Paula Abdul -- it was just one misstep after another. And after all that, for the second consecutive year, the less mainstream contestant failed to capture enough votes to take the title of "American Idol." Lee DeWyze isn't terrible, but he's no Crystal "MamaSox" Bowersox. More than one CNN.com commenter pointed out that we've been here before. "Makes sense that the least talented would win, since the season only had one great performer, and 11 so-so singers," a commenter named Jason posted to the CNN Marquee blog. "I guess, even though I cannot stand [Adam Lambert], this makes 2 seasons in a row where the clear winner got robbed." When Kris Allen triumphed over Lambert last year, fans cried foul, alleging everything from poor phone lines that didn't allow them to vote to a conspiracy by Christian viewers to portray the androgynous Lambert as a force of evil versus the clean-cut former Praise and Worship leader Allen. But on "Idol" -- at least the last couple years -- it helps to have less of an edge. It also helps to have teeny-bopper appeal. Like Allen, DeWyze is a sweet-faced guitarist who rose through the pack of performers partially by making the girls swoon. And like Lambert, Bowersox is the funkier performer, with dreadlocks and a laid-back persona that some viewers read as apathetic. There's no doubt that they both have talent. Adorable in that shy-guy kind of way, DeWyze consistently strummed his way into the judges' hearts with his determination and oft-repeated back story of being a paint salesman with a dream. In the wake of his win, DeWyze's previously recorded "Slumberland" reached No. 17 on the Billboard Top Heatseekers chart. Yet watching his matchup against Bowersox during the final performances, the single mother clearly bested DeWyze in every department. She sang like a dream, had charisma and earned praise from the judges, who took DeWyze to task for a seeming lack of energy and passion. "That [performance] was a kiss on the cheek when I want a kiss on the lips" is how departing judge Simon Cowell characterized DeWyze's rendition of "The Boxer," which opened Tuesday night's show. Bowersox was a favorite early on, with producers taking the unusual step of switching the performance night schedule to accommodate the diabetic singer when she fell ill during the Top 24 rounds. Throughout the season, fans, bloggers and the judges hailed her for her musicality and individuality as an artist, even as DeWyze scored points for improving week after week and pushing past his clear discomfort on such a large stage. But while DeWyze was urged by judges and critics alike to relax and enjoy the season more, Bowersox seemed born to perform. "Who would you rather see in concert -- someone who has limited abilities like Lee or someone who owns the stage like Crystal?" asked iReporter Gary Wolfe of Huntsville, Alabama. Despite what the "Idol" finale performer lineup might have you to believe by trotting out McDonald, Chicago, the Bee Gees and Hall and Oates, the show has always attracted young viewers and voters -- and it was those nimble fingers that have been willing to dial and text often to ensure victory for their favorite. And though TV by the Numbers reports that this year's finale ratings were down 16 percent with viewers overall and 18 percent with the key demographic of adults 18-49, it still drew 24.2 million viewers, keeping the show firmly in first place as the most popular on television. Recent "Idol" winners haven't exactly lit up the charts. Perhaps viewers have grown tired of even pretending that the title matters. After all, last year's runner-up, Lambert, continues to generate more interest than winner Allen, and Chris Daughtry (a fourth-place finisher in season five) has outsold every "Idol" except Kelly Clarkson (season one) and Carrie Underwood (season four). Or it could be that after nine seasons, "Idol" is showing its age in more ways than featuring Joe Cocker as one of the final performers of the finale. While pundits debate what the departure of popular judge and voice of reason Cowell will mean to the show's future, they might also want to factor in something else: How long will fans be willing to watch a talent contest that continues to prove that the best man or woman doesn't always win?